“Homemade”. This is an appropriate term for both the meal and the subject wine this article discusses. I’d been flirting with the idea of making “Paella” for a while and when I ran across some wonderfully fresh seafood at the local market, the die was cast. I’ve never made Paella in my life. I’ve ordered many times so I had an idea of what needed to be done. That said, this may not be the most traditional or authentic version of the dish, but it’s easy and delicious. This dish is very simple to pull off. As with other mixed seafood entrees, the key is getting the timing and the order of cooking the fish correct. Set the rice on the stove according to the package instructions. This will take 25 minutes and once done, the rice can stay in the pot and will keep warm until you’re ready to serve. Slice the calamari bodies into rings, rinse the clams, pat the Sea Bass dry and set to mis en place. 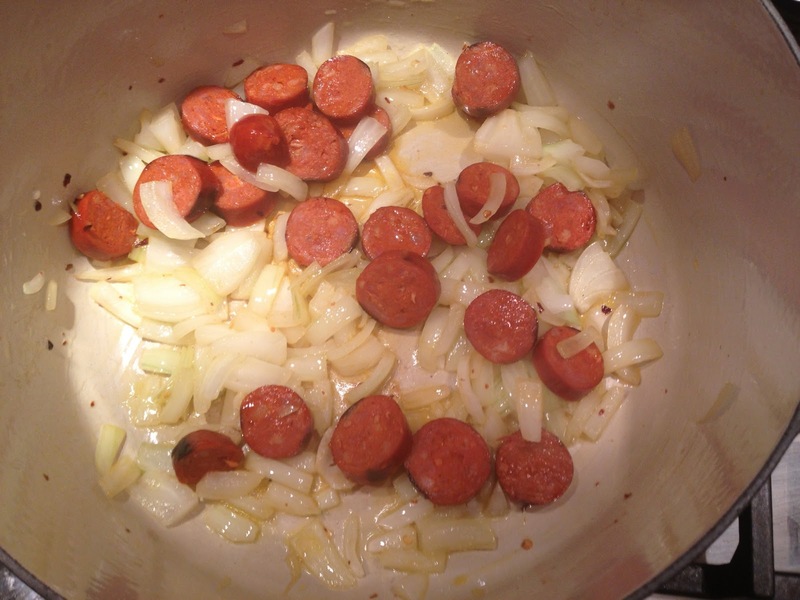 Begin sauteing the onion and the Chorizo in the olive oil. While this is working, season the Sea Bass with salt & pepper and sear on the stove top until almost completely cooked through. Set aside to keep warm. Once the onions and sausage are sweated enough, the onions will be softened and the sausage will pick up some color, you add the white wine and tomato puree to the pot. 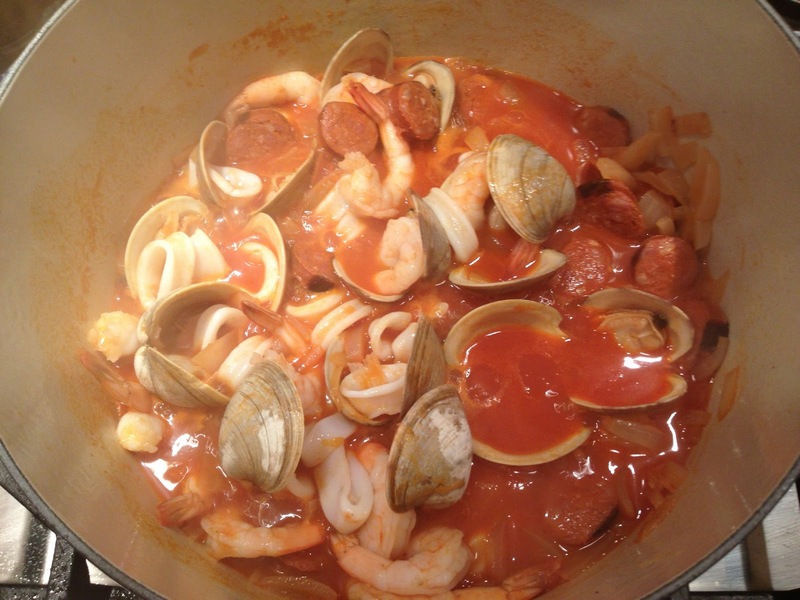 Add the clams, cover, and simmer for 15-20 minutes until the clams steam open. By the time the clams steam open, the rice and Sea Bass will be done, and you’ll be ready to begin the final assembly of the dish. I had the shrimp ready to go into the pot, along with the sliced calamari. Be ready to serve. Once you add the Shrimp and Calamari, they will cook through in less than 1 minute. The next step is to add the rice to the pot. It’s important to remember to do this before you add the Sea Bass, otherwise the fish will break into unattractive bits. This is also great because the rice will absorb even more flavor from the wine and tomato and really melds the dish together. Once you add the rice, stir it through well and then add the Sea Bass. Cover and simmer for 1-2 minutes and prepare to serve. Finally, the plated dish. Had it not been deluging outside, I would have gone to the garden for fresh parsley! So, what to drink? 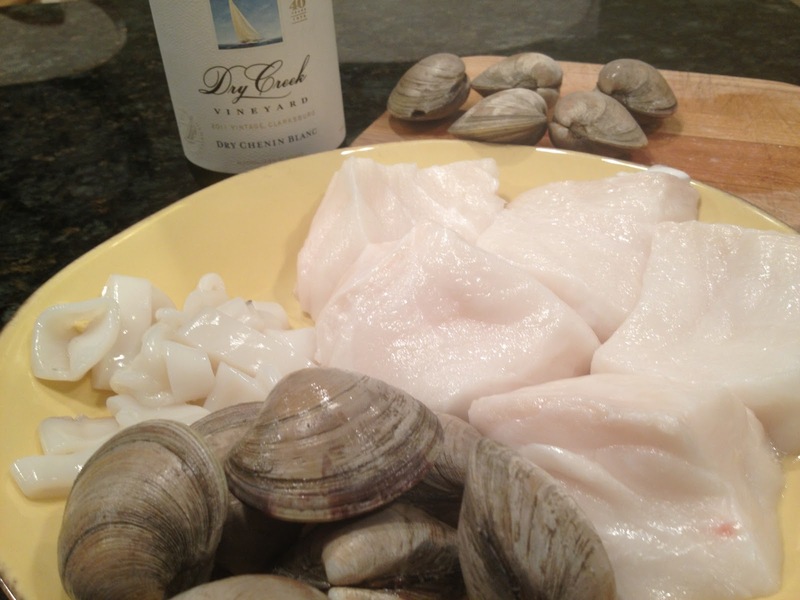 I enjoyed a 2011 Dry Creek Vineyard Chenin Blanc while cooking the dish and also with the meal. The ever so slightly sweet exotic, tropical fruit in the wine paired well with the slight heat of the dish from the Chorizo. It’s a great value at under $12. Crisp, clean, pure and refreshing. 90 points. I was also following my own advice to “drink what’s local” when wondering what to pair with a dish. I turned to the Tuscan coast for inspiration and to a wine I’ve been wanting to try for some time. The Due Mani winery is located in Riparbella Tuscany, south of Lucca and closer to the ocean. This fully bio-dynamic vineyard is the brainchild of winemaking guru Luca d’Attoma and his wife Elena Celli. Together their “Due Mani” (Two Hands) make wine from the classic Bordeaux varietals which find such a natural home near the Tuscan coast. The Estates seven hectares of vineyards are located about 2-3 miles from the coast and lie just north of the official Bolgheri DOC. There’s a slight valley to the topography here and the vines benefit from the gentle winds that waft through the valley, bringing night time temperatures down and preserving the acidity and the complexity in the grapes. Arguably, Due Mani’s first wine is a 100% Cabernet Franc called “Due Mani”. D’Attoma understands Cabernet Franc better than anyone in Tuscany. His stewardship of Paleo at Le Macchiole bears wonderful evidence to the claim. This understanding also benefits Due Mani’s “Altrovino” – cleverly, the “Other Wine”. 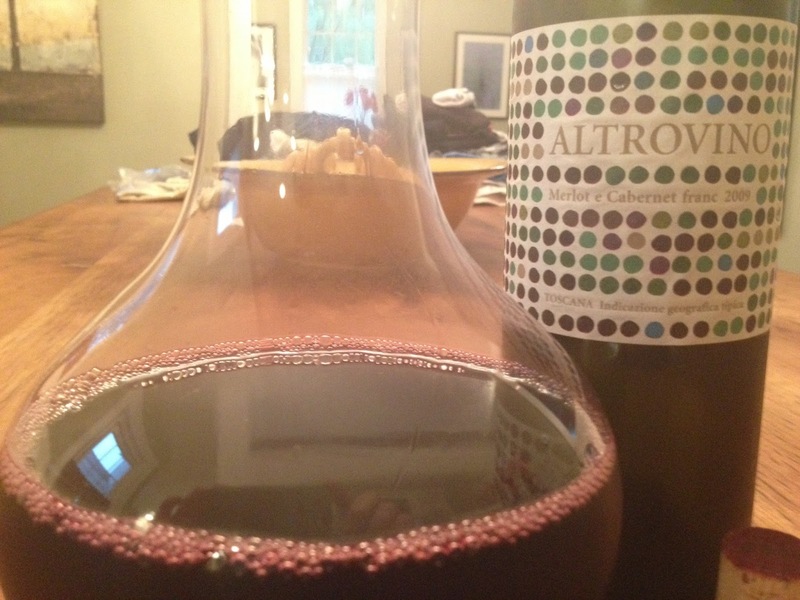 The 2009 Altrovino is a blend of 50% Cabernet Franc and 50% Merlot. Biodynamic and old school, fermentation and aging takes place in cement vats. Stripped down purity with not the faintest hint of oak is what this wine becomes. It’s a dark, vibrant purple in the glass. The aromas pour forth and they are focused and pure. Crushed berry, sage, lavendar, mineral, and sweet pipe tobacco are harmonius. On the palate, the refinement is notable. This is classy. The danger of Cabernet Franc is that if it doesn’t get ripe enough, it becomes vegetal. There’s none of that here, and the velvety texture the Merlot contributes to the blend only amplifies that fact. Altrovino is medium to full bodied with ripe crushed black berry and plum flavors framed by the same fresh herbs and floral notes that are present on the nose. This is simply delicious wine, but not simple in any way. 92 points, about $38 and a great value. My only complaint…I hate the label! A Chianti, a Cabernet, and a Horse walk into a barbecue…. Looks delicious, bro, but it definitely isn't a traditional paella. In a traditional paella, the rice and protein(s) all get cooked in the same pan. 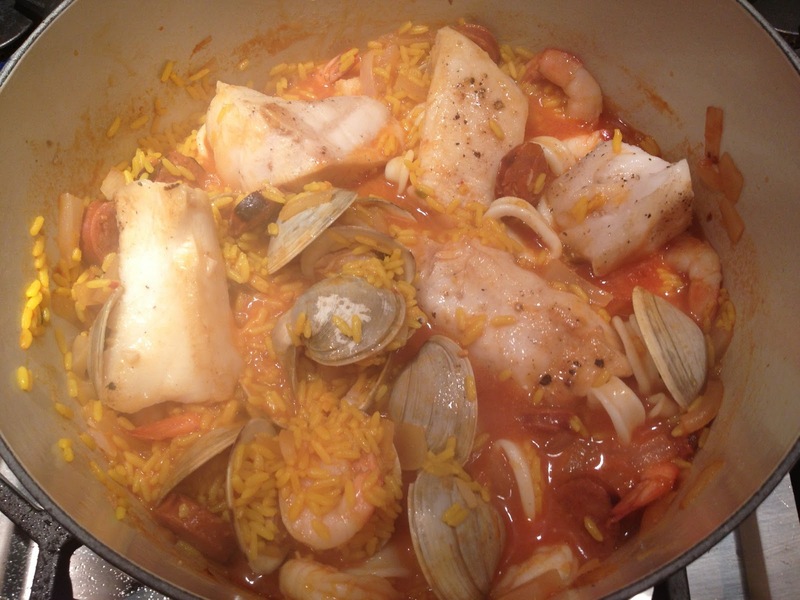 It looks like what you have here is a wonderful seafood stew served over yellow Spanish rice. 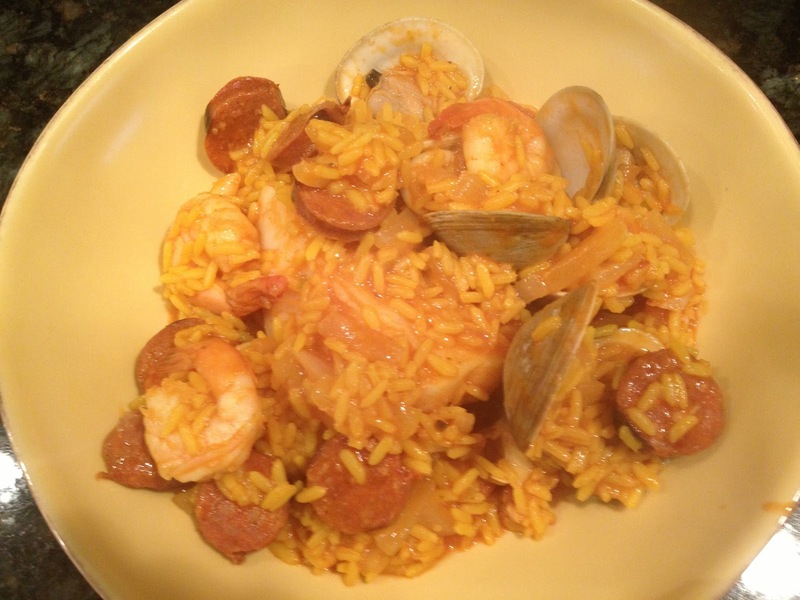 According to Penelope Cassas, guru of Spanish cooking, the idea of chorizo (or pork or chicken) in a seafood paella is an Americanized version of the dish. I guess that would be kind of like serving osso bucco over pasta – the two just shouldn't be mixed. I know the Cubans also have a different take on paella that seems to be closer in nature to a gumbo type dish with more sauce. Maybe that's the style of paella that you have had up there?